Additional Services Acworth, GA - Matthew's Tree Service Inc.
Click on service to view a descripiton. Tree care experts have utilized steel cabling in order to secure damaged trees for more than a century. This is done to control structural weaknesses in specimens of high-value in addition to reducing the risk from hazards. After decades of increased understanding of trees ensued, it has been revealed that when limbs are allowed to move freely, they will create reaction wood in certain areas to reduce the chances of failure such as splitting. Using a restrictive cable can actually result in a weakening of the trees that had been depending on the support they provided. In addition securing cables to trees with bolts is invasive to the tree tissues. 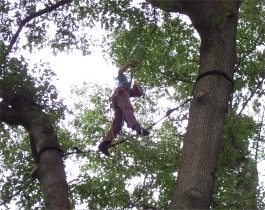 At Matthew’s Tree Service Inc., we provide dynamic cabling methods whenever they are needed. The use of dynamic cabling minimizes the chance of failure at the site of codominant stems while still allowing the formation of reaction wood. Introducing a shock absorber into the cooling system leaves some slack in the cable which will only be used during extreme loading periods. Loading events activate the shock absorber which dampens the jerking effect that can create excessive loading at the cable anchor points. Since the support is only used in extreme loading situations, the cable is not relied on as a crutch by the tree. With a growth loops included in the cabling system, limbs are allowed to grow in diameter as system remains in check. Matthew’s Tree Service Inc.. also offers root excavation and fine pruning to extend the life of the trees on your landscape. Contact us for more information about these services by calling (770) 926-7985 today.